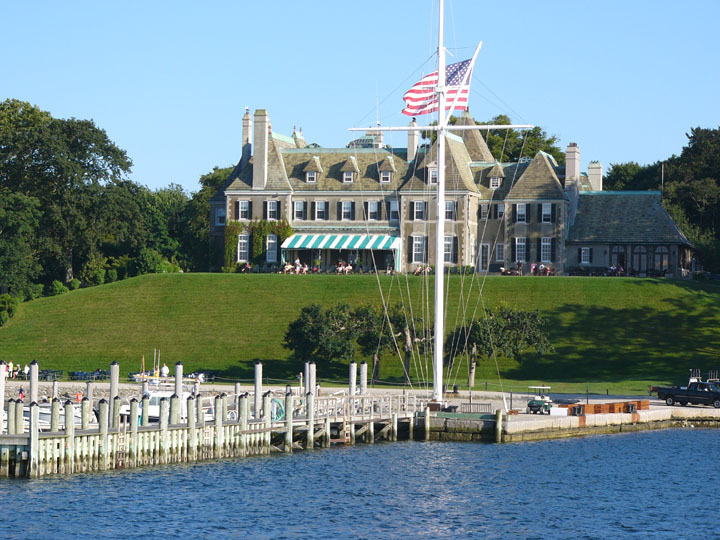 Standing on eight acres, the New York Yacht Club is housed in a Renaissance Norman-style mansion. It boasts 19 bedrooms and five apartments for members, their families, and friends. Each room has a story to tell, with artwork and decorations praising the ocean, and celebrating the history of the sports of sailing and yachting. There is an elegant formal dining room, paneled in oak. The Model Room hosts member-sponsored functions: meetings, weddings, parties and special events. The model room is large, with high ceilings and takes up the central prominence with approximately 3,800 square feet. The walls are adorned with display cases. More intimate gatherings are accommodated in the Commodores Room, the Afterguard Room or the Wardroom Terrace that overlooks the spacious ground, formal gardens and beautiful bayside.